The Nefkens Group has been active in the mobility sector since 1878 and is one of the leading automotive concerns in the Netherlands. Nefkens also operates a fleet of lease vehicles and is the official dealer for Peugeot and Opel. The extensive dealer network in the Netherlands takes care of new and used car sales, maintenance and repair, as well as selling original spare parts. The head office – and digital heart – of the Nefkens Group is in Utrecht. Problem-free e-mail traffic provides many benefits for the Nefkens Group automotive concern. Competition is intense in the automotive industry, so the ability to act quickly and efficiently is crucial. E-mail communication is fast and efficient, but there is more to is than meets the eye. Companies using e-mail also need to maintain an optimum e-mail environment to guard against risks such as viruses, system overload and improper use. The Nefkens Group is connected to a large WAN that runs all the company’s business-critical applications. 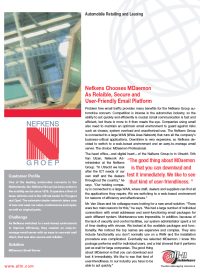 Downtime is very expensive, so Nefkens decided to switch to a web-based environment and an easy-to-manage e-mail server. The choice: MDaemon Professional. Portland (http://www.portland.nl) is the exclusive distributor for Alt-N’s products in the Netherlands.